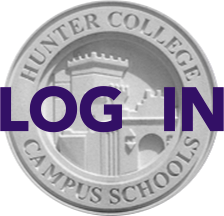 With music - including an original composition - and surrounded by teachers, administration, family and friends, the Class of 2013 said farewell to Hunter College High School on Thursday, June 13. In a warm, full and emotional ceremony, speakers emphasized again and again that graduation is a collective occasion, one that departing seniors experience in solidarity with their classmates and a milestone they reach with the constant support and sacrifice of their families, their teachers and their school. That feeling was everywhere in the moments before the ceremony began - parents spotting each other, students from other grades playing stately music under Mr. Stratechuk’s direction and, most moving of all, the Hunter faculty seated in one huge section, grouped by department. Hunter College High School Principal Dr. Tony Fisher, High School Assistant Principal Ms. Lisa Siegmann and Middle School Assistant Principal Mr. Jonathan Silkowitz and all the academic department chairs ascended the stage of the Hunter College Assembly Hall in their gowns. Everyone was there for our seniors…. In her greeting, Hunter College President Jennifer Raab told the graduating class that of all her credentials, the only diploma that hangs on her wall is the one they would be receiving; her Hunter College High School education had set the course for the rest of her journey. Joking that their brains were shrinking every year, District 4 Councilman Daniel Garodnick then told graduates that now is the time to try new things they had never imagined themselves doing. It is a Hunter tradition to invite a Distinguished Graduate to Commencement every year. Assistant Principal Lisa Siegmann introduced this year’s Distinguished Graduate, Jon Daniels of the Texas Rangers (Class of 1995), who in 2005, at the age of 28, became the youngest general manager in baseball history. Mr. Daniels said that Hunter had opened his eyes to New York City and taught him to appreciate people of all different backgrounds, a real asset in his interactions with very diverse baseball players from all 50 states and several other countries. Drew Adler, representing the Hunter baseball team, presented Mr. Daniels with Hunter athletic swag. The Distinguished Grad urged 2013 graduates not to rely on the name of their school or college, to shun nepotism and succeed on their own merit and hard work, and to carefully surround themselves with good and decent people who would challenge them. “We grew up together,” Principal Dr. Tony Fisher told the graduating class, “and you will have a special place in my heart.” As their Assistant Principal for all three years of Middle School and their high school principal after that, he was with them for the full ride. Dr. Fisher, too, reminded seniors that they had not reached graduation day alone and told stories they themselves had shared with him about their teachers and their classmates – from the teacher who imparted life wisdom to a student rejected by her crush, to the administrator who pretended to be a pigeon in a psychology class, to an encouraging classmate who helped a struggling 2013er go on to excel in the very subject causing all the trouble. He urged graduates to stay in touch and always seek like-minded souls who shared their sense of purpose. “As amazingly talented as you are, you can achieve so much more if you are part of a team, and part of a true community,” he said. Memorable student moments abounded. In her Salutations, Rachel Kaly joked that graduates would now be entering the world of more-than-four-hours’ sleep. Carolyn Kettig read a passage from Jonathan Safran Foer’s Extremely Loud and Incredibly Close about moving one grain of sand in the Sahara Desert and changing the course of human history. Delivering the Class Speech, Simon Bloch drew laughter and great emotion as he described the incredible bond and solidarity of multi-talented 2013 and its “exceptionally individual characters”. Term Council Presidents Karen Chen and Jenna Shapiro announced that new water fountains would be the senior gift and presented gifts to Ms. Jana Lucash, 2013 Term Advisor of five years, and Ms. Satinder Jawanda, who served as Term Advisor this year while Ms. Lucash was on maternity leave. Earlier in the program, Dr. Fisher had noted that 2013 was a particularly theatrical class. But it was also a very musical one. The Senior Chorus sang “Home,” accompanied by Alex Golin on guitar and David Lee on drums and conducted by May Treuhaft-Ali. In addition, a 2013 jazz group composed of seniors Nick Burka, Andrew Backer, Arielle Korman, David Lee, Jon Merwin, Erik Outhwaite, and Oliver Yu played "Grown Blue," an original composition by trumpeter Nick Burka, expressing his feelings about taking leave of Hunter. As Ms. Jawanda announced the graduates’ names, Ms. Siegmann and Mr. Silkowitz conferred diplomas, one by one. The entire class sang the Hunter alma mater, with Zack Elkind and Lily Filippatos conducting. Simon Bloch had said that 2013 was anything but uniform – which might be one reason that singing the alma mater in unison was a bit difficult…. After this very moving ceremony, a record crowd of 750 graduates and guests headed to the Hunter College Dining Hall for a reception at which they sampled exquisite hors-d’oeuvres and had a chance to say good-bye. In keeping with tradition, the reception was organized and coordinated by 2014 parents, with juniors volunteering as waiters and waitresses, dressed in purple T-shirts and making the rounds with their trays. The room was decorated with lanterns and Hunter banners and though it was packed, people somehow found everyone they were looking for. The teachers were there, kidding around with their seniors, and exchanging meaningful words with them. Graduates took photos with their friends. Parents found other parents in the Hunter community with whom they had grown close over the years. It was the beautiful culmination of a year in which 2013 carried each other, grew ever closer, and realized they would be friends for life.